The application below to subdivide this open space comes before the Development Committee on the 22nd of this month. It is an attempt- similar to the recent Three Owls Farm application - to continue seeking to develop this space. The image below shows how it looked for many decades until the present owners bought it. Please take the time to support Blakeney Parish Council by endorsing the objections given below and send them to this address. The Appeal Decision follows at the bottom. Each report for decision on this Agenda shows the Officer responsible, the recommendation of the Head of Planning and in the case of private business the paragraph(s) of Schedule 12A to the Local Government Act 1972 under which it is considered exempt. None of the reports have financial, legal or policy implications save where indicated. Originally at the request of Cllr. A. Wells (prior to resigning as a Councillor) having regard to the earth bank would not enhance the open character of the land and is therefore contrary to the aims of Core Strategy Policy CT1: Open Space Designations. Cllr S. Butikofer has raised no objection to Committee determining the application.  It clearly begins to sub-divide the Open Space. The work which has already been completed is contrary to Core Strategy Policies EN1 (AONB), EN2 (Protection and Enhancement of Landscape and Settlement Character) and CT1 (Open Space Designation).  This application relates directly to two previously unsuccessful planning applications which sought to erect detached dwellings at the site (PF/15/0483 & PF/15/1898). Hence this compartmental use of an Open Land area is significant to the future use of this land.  Whilst the hedge running along Sheila’s Way would provide a greater degree of privacy to the applicant, the hedge running east west divides the land into two plots, as per the recently refused planning applications, and contravenes the open space policy that applies to the land.  The earthworks appear to be a deliberate attempt to envelop the open space and change its appearance, natural land levels and character in an attempt to overcome the reasons for the previously refused applications.  The works are clearly a device to facilitate the intentions of the applicant to build on the land and profit therefrom.  The earth bank is either a well-meaning proposal or a calculated manipulation of the planning process; a precursor to develop and an urbanisation of a green space at the heart of the village.  The land has historically been an open meadow which has been enjoyed by generations and is important to the character and appreciation of the Blakeney Conservation Area.  The current application should not be considered in isolation, the two previously refused applications to erect dwellings at the site have a bearing on this application. 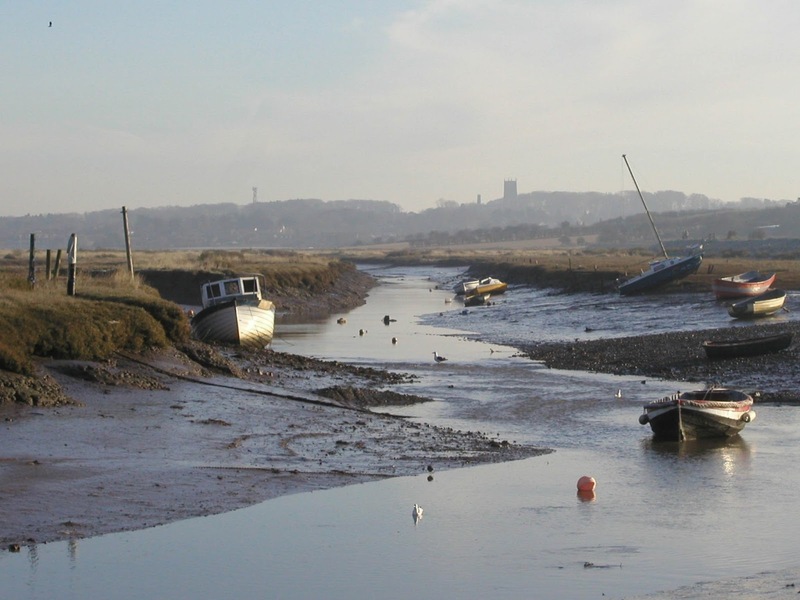 proposed development would not be detrimental to the character and appearance of Blakeney Conservation Area. Consequently, the Conservation and Design team raised no objection to the proposal. identified in the Local Plan under Policy CT1. landscape and visual impact of development proposals are key areas of consideration. appear as a contrived feature in the landscape. keeping with the site context, which features other mature hedgerows in the vicinity. The appeal is made by Mr Alistair Lindop and Ms Jane Armstrong against the decision of North Norfolk District Council. The application Ref PF/15/0483, dated 31 March 2015, was refused by notice dated 15 September 2015. The development proposed is erection of a two storey detached dwelling with garage. 2. The effect of the development on the character and appearance of the designated Open Land Area and the surrounding area including the Blakeney Conservation Area (the Conservation Area) and the Norfolk Coast Area of Outstanding Natural Beauty (the AONB). The appeal site comprises an open parcel of grassed land associated with no. 39 New Road accessed off Little Lane close to its junction with the A149 which runs through the village. 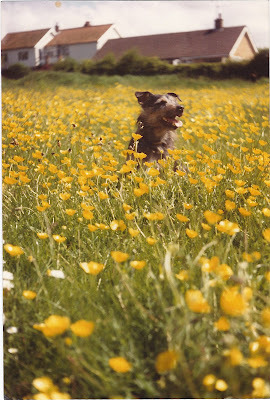 It forms part of a wider area of land designated as Open Land Area under Policy CT1 of the North Norfolk Core Strategy 2008 (the Core Strategy) which incorporates an area of open green space, known as The Pastures, to the north and playing fields associated with the Blakeney Village Hall to the west. The site is located within the settlement development boundary, on the western edge of the Conservation Area and within the AONB. The proposed dwelling comprises two elements. The main two storey house would face northward onto the proposed shingle driveway/parking area. A single storey L-shaped link extension would be attached at the rear, incorporating a garage/workshop and utility. The proposed dwelling would be built using traditional materials with a pitched pantile roof and constructed so that it would sit into the slope of the site, which rises gradually in an easterly direction from the A149 road. The proposed boundary treatment includes enhanced hedge planting and a 1.8m high flint wall on the north western corner of the site. The National Planning Policy Framework (the Framework) postdates the Core Strategy. However, as is pointed out in paragraph 211 of the Framework, for the purpose of decision making, the policies should not be considered out of date simply because they were adopted prior to the publication of the Framework. Paragraph 215 of the Framework states that due weight should be given to relevant policies in existing plans according to their degree of consistency with the Framework. I consider that Policy CT1 of the Core Strategy is both relevant and consistent in terms of the requirements relating to the impact on the open character and recreational use of the land. Likewise, its approach to the circumstance under which development may occur on the designated Open Land Areas is both relevant and consistent with the Framework. I note the differing views between the main parties about whether or not the appeal site would meet the criteria in Paragraph 77 of the Framework and thus, qualify to be designated as a Local Open Space. However, Paragraph 76 of the Framework clearly sets out Local Open Space should only be designated when a plan is being prepared or reviewed and as such is not considered appropriate to this case. Nevertheless, the land is clearly identified as an Open Land Area in the Core Strategy Proposals Map and, as such, will be judged against Policy CT1 which states that “development will not be permitted except where it enhances the open character or recreational use of the land”. The proposal would represent a significant shift of the built development northwards into the Open Land Area. The appeal site, together with the adjoining open space and playing fields, provide a significant contribution to the visual quality and the openness of the area. It adds substantially to the character and appearance of this part of the village and provides an important contribution to the setting of the historic part of the village. Notwithstanding, the above mentioned boundary treatment and proposal to construct the dwelling into the slope of the site, the proposed development would not enhance the open character of the land or recreational use of the land. The site would be visible when approaching the land from both the north-west and south-east along the A149, from the Pastures to the north and playing fields to the west. From points within this area the proposed dwelling would have a significant visual presence. The designation of the site as Open Land Area recognises the visual quality of the land and importance of the value of retaining the site as green open space within the village not only in terms of Policy CT1 but also the Conservation Area and AONB. I conclude that the proposed development would in principle be contrary to Policy CT1 of the Core Strategy. Similarly, the scale and design of the building would not relate sympathetically to the open character of the land and its surroundings. Notwithstanding the proposed incorporation of traditional materials such as pantiles, red brick and flint, it would fail to sufficiently reflect the identity of the local surroundings or reinforce local distinctiveness. The front elevation of the main house and the proposed balcony running across the northern elevation of the building, particularly when viewed from the north and north-west, would emphasize the building’s bulk and its contrast with the built form and the open character of the appeal site and the surrounding area. I conclude that the proposed dwelling would have a significant adverse impact on the character and appearance of the appeal site and the surrounding area. As such I consider that the proposed development, by virtue of its location, scale and design would adversely impact on the openness of the Open Land Area and would be harmful to the character and appearance of the surrounding area. Consequently, the proposal would conflict with Policies CT1, EN2 and EN4 of the Core Strategy and paragraphs 58 and 60 of the Framework. These policies, amongst other things, seek to ensure that development proposals preserve and, where possible, enhance the special qualities and local distinctiveness of the settlements and their landscape setting, through high quality design. The harm would, though, be relatively local in extent and not such as to materially detract from the overall special qualities of the AONB. However, the effect of the proposed development on views into and across the Conservation Area on the approaches along the A149 and from the adjoining open space to the north and west, respectively, would neither preserve nor enhance the character and appearance of the Conservation Area or its setting. Whilst the harm would be less than substantial, it adds to that identified above and that harm should be weighed against any public benefits to the proposal. I note the appellant’s intention to construct a highly energy efficient building using traditional materials with additional landscaping and boundary treatment, which with time, may mitigate, to some extent, the impact of the proposed building. However, these benefits would not outweigh the harm that the proposed dwelling would cause to the character and appearance of the Conservation Area. Consequently, I conclude the development would conflict with Policies EN2 and EN8 of the Core Strategy and the Framework, which seeks to ensure that development proposals preserve and, where possible, enhance the character and appearance of the conservation areas and their settings through high quality, sensitive design. The proposed dwelling fails to comply with the Framework as outlined above and also paragraphs 17, 56 and 64, which contain amongst other matters, the requirement for high quality design that responds to the character and appearance of the area. I have taken into account all the matters raised in the evidence, including the comments from those consulted on the application and, those housing developments and planning permissions in the area drawn to my attention by the appellant. I am not convinced their circumstances are compellingly similar to those of the present appeal proposal, particularly given that the detailed context of the appeal site is important to my assessment. I therefore accord these limited weight in this case. Both the appellant and the Local Planning Authority have drawn attention to the previous Inspector’s decision on the site in 1985. However, all planning appeals must be determined on their individual merits and I have so determined this appeal. I note the dispute between the main parties about the planning status of the appeal site as a garden. However, it is not for me, under a Section 78 Appeal to determine the lawful use of the land. To that end it is open to the appellant to apply for a determination under section 191/192 of the Act. In any event Policy CT1 of the Core Strategy applies to the appeal site. 17. For the reasons given above, and having regard to all other matters raised, I conclude the appeal should be dismissed. There are two applications, the first is for a change in design and the second is for the same change in design but also, more crucially, for a shift in location to outside the ‘site area’ and much closer to the first proposal which was categorically dismissed on appeal. The change in design involves a roof re-alignment, which doesn’t change the maximum height from the consent given but increases the amount of roof at that maximum height, thus increasing the overall bulk and appearance of the building. The building is also larger by some 4.5% on gross external area (now 828 sq metres cf. the existing bungalow of 160 sq metres – or 5.18 times larger) with at least one extra room bringing the total number of ‘rooms’ to 27. The proposed repositioning of the building in the second application is the most worrying. It has been moved eastwards a further 17.5 metres away from the existing bungalow (and the consent given) with at least 60% of the footprint of the building outside the established ‘site area’ of 0.80 hectares and is now only 10 metres away from the original application quite clearly dismissed on appeal. The excuse given is ‘to save the three poplar trees which were to be removed’! In respect of the Application document relating to both applications: - Item 5. Pre-application advice‘Has assistance or prior advice been sought from the local authority?’ –This could be useful if it was discovered that was not the case. Item 14. Biodiversity and Geological Conservation‘Is there a reasonable likelihood of the following being affected adversely: -(a) Protected and priority species? – ‘No’. This should be ‘yes’ for land adjacent (and possibly the development site as they have gone beyond the boundary making the whole landholding the development site). Nightingales occur on the landholding and on land adjacent and they are a Schedule 1 species. (b) Designated sites, important habitats or other biodiversity features? – ‘No’. This again should be yes relating to Wiveton Downs and land bordering the whole landholding. Item 22. Site Area What is the site area? – 0.80 hectares – This would not be the case for the second application where the proposal extends well beyond the site area into the whole landholding of some 15 hectares. On the face of it, it looks as if we may be in for a series of applications that gradually move this monster house closer and closer to the applicant’s original application. With the location of the house moved there are clear grounds to object once more and we sincerely hope that all of you will. Recently NNDC have used the Heritage Setting (National Planning Policy) of Wiveton and Cley Churches in relation to a comparatively small planning application in Wiveton. In all of the previous Three Owls applications they disregarded it when it was actually much more significant. So in the event, however unlikely, that NNDC now consider these Churches worthy of protection it might be worth including this again. 1. The proposal to move the house 17 metres to just 10 metres away from that of the original application, which was quite clearly dismissed at the first appeal. 2. That it has to be unacceptable to increase the size of a house that will in any case be so hugely intrusive. .4. It is crucial that this is not considered on a comparative basis with what has been already been approved i.e. it’s only slightly bigger than what has been approved and only a few metres from the approved position. These are typical developers tricks to get stuff through. We need NNDC to look at this afresh and to consider how it sits against the basic policies like H08. Please do take the trouble to object and very importantly pass this on to all those you think will respond. To do so follow these links? Click Search Comment here …. This how they do it. knowledge, which are best placed to decide the most sustainable, suitable and viable sites for new homes. The Housing and Planning Act 2016 has increased local people’s power to plan their areas with new measures to speed up and simplify neighbourhood planning. support large housing sites. We expect 50% of this Fund to be spent on brownfield land. In addition, £1.2 billion of our £2.3 billion starter homes funding will support brownfield site preparation; delivering at least 30,000 starter homes. Green Belt remains constant at around 13% of England, and in 2014-15 there was only a 0.1% reduction in size as a result of Local Plan reviews. Furthermore, only 0.02% of Green Belt was converted to residential use, after consulting local people. Taking account of land reclassified as national park, the Green Belt is actually 120 square miles larger than in 1997. If like me you are disappointed that BPC have felt it necessary to do this please let them know here. I accept that I may be over-sensitive when it comes to people taking an axe to the village I love and grew up in, and I really do accept that change is inevitable. But things in Blakeney seem to be spiraling out of control. There has been more damage done to the character and fabric of the village in the first few years of this century than in any similar period in its history. Developers are filling every nook and cranny they can find, and the accretion of this piecemeal and unplanned development is becoming seriously detrimental too the look and shape of the village. 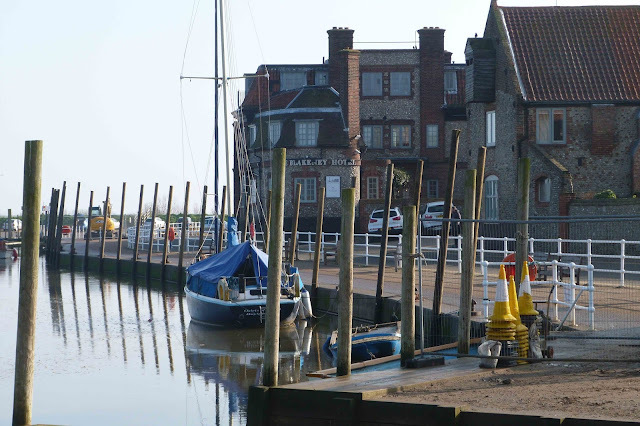 Blakeney is undisputedly North Norfolk's iconic coastal village, is at the heart of the North Norfolk Coast AONB, and is a Conservation Area; yet greedy developers are pillaging it. It is the responsibility of the Parish Council and NNDC to have an overall plan to ensure that such a special place develops in step with its history. NNDC have the Local Plan (which sadly is now part of the problem here) and Blakeney has a Village Design Statement, which while NNDC claim it no longer accepts as supplementary planning guidance could be used as a basis (supported by its consensus) to oppose the worst of what is happening. Blakeney PC did fight hard to prevent the Three Owls development and have opposed others, but I think they could much more; firstly by setting a good example themselves. Which brings me to what is happening around the quayside and the forest of large poles that have destroyed the lovely open views of the marshes, the sea, and of course the quayside itself. Blakeney already had more posts and bollards than most village along this coast, but this is beyond anything anyone could have predicted. Does no one care how the place looks? Diners in the Blakeney Hotel will think they are in prison. Having sailed out of Blakeney for over 65 years I do not need a lecture on why these posts are ‘thought’ to be necessary, but it is that long perspective that offers the explanation for why they are not, and never were needed. Apparently BPC approached the Boatman’s Association some time ago asking if they would contribute financially toward these poles. They said NO - because they did not think they were needed. Large boats coming onto the road as occurred in the 2013 surge are rare events, 1953 being the only other time it has happened in living memory; small boats do so more often, but rarely with any significant damage to anything other than themselves. If there were some oversight of quayside moorings this could easily be prevented, or failing that a total ban on boats over ten feet from November to March. Although, having said that boat owners themselves should be responsible for mooring their boats properly along the quay, not the Parish Council. It's no good people just abandoning boats for the winter and expecting others to worry about them – if the owners are too stupid or inexperienced to realise what is needed to prevent them being damaged it is their problem not the Parish Council’s. Surely any option would be better than such total desecration of the quayside’s character, particularly as it is completely needless. We do not always need a sledgehammer to crack such small nuts. I may be a lone voice here, and if that’s true I will be silenced by the silence. If not I hope that all of you that feel the same will let BPC know and perhaps they’ll think again? Come on BPC you can do a lot better than this. Proposal to erect a 30metre high shared telecommunications tower with six antennas and associated ground-based cabinets. At Friary Farm Blakeney. 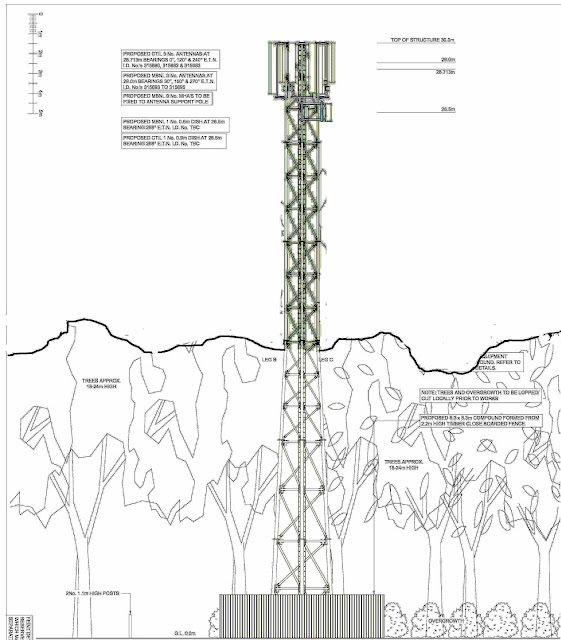 Our principal objection to this application is the major landscape impact that a telecommunications mast of this scale would have in this particular location. A prominent headland that constitutes a significant element in the North Norfolk Coast Area of Outstanding Natural Beauty and overlooking two Conservation Areas. It would be hard to understate the importance of this particular landscape feature in the north Norfolk coastal scene, visible in both directions east and west this wooded headland with Blakeney Church at its crest it is as familiar and important a landscape feature in this part of Norfolk as Glastonbury Tor is to its part of Somerset. A recent study showed that tourism is by quite a large margin the largest underwriter of Norfolk’s economy, of that income a significant amount is generated here in North Norfolk, the reason for this is that the people who visit the area do so because of its unspoilt beauty. Again and again surveys show this to be true. 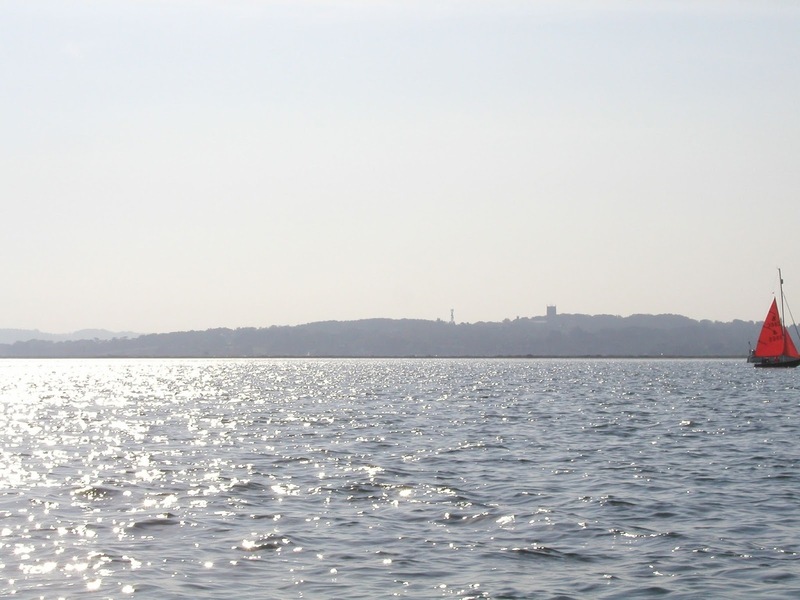 Visible from the Norfolk Coast Path from as far off as Wells in the west and for a similar distance to the east as far as Sheringham it is also very prominent from a number of important visitor centers. The National Nature Reserve of Blakeney Point, the Harbour and departure point at Morston [See picture 1] where every day during the summer hundreds of tourists stand looking at this view as they wait to embark on excursions to see the seals and bird sanctuary. Cley Nature Reserve to the east also has this belt of trees as its western horizon. [See picture 2] So significant is this site that it is the opinion of all three Parish Councils that this mast represents a defining test of the strength of the AONB designation. If this mast were to go up then the AONB designation comes down, probably to a point where it will not be worth all the mountains policy paper it is written on. 2. The option of St Nicholas Church Tower, Blakeney. Arqiva claim that the space needed for the required cabinets and their combined weight makes this option untenable. Blakeney Church Tower is one of the largest Parish Church towers in the country and has within it not one [The Belfry] but two [The Clock Room] spaces wherein equipment could be accommodated. Arqiva claim to have examined this option, but from their replies to our enquiries regarding its possible use, it seems fairly clear that they have not done this with any rigor. This option was explored as long ago as 2004 and found to be quite suitable, and it seems odd that Arqiva have not looked at what happened then. We feel it would be a great shame to have these views destroyed when a better option is available. The National Planning Policy Framework states that in an AONB, “ The aim should be to keep the numbers of radio and telecoms masts and the sites to a minimum consistent with the efficient operation of the network. Existing masts, buildings and other structures should be used, unless the need for a new site has been justified. Where new sites are required, equipment should be sympathetically designed and camouflaged where appropriate.”It would seem that Aqiva’s haste to get an application in within the MIP’s limited time frame has resulted in a very superficial assessment of all the other options. This can only produce a result we will regret. Act in haste repent at leisure. 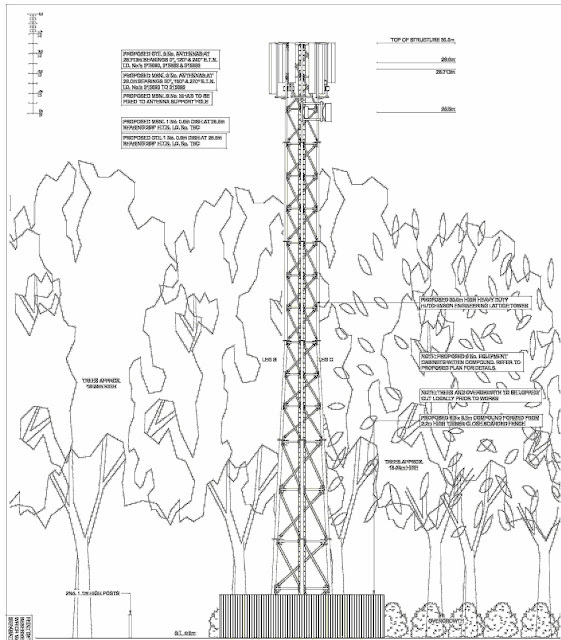 The line drawing submitted by Arqiva that shows this mast extending just a small amount above the trees is misleading, the trees have been measured and found to be considerably lower than shown of the plan (see drawings included). This difference means that the mast would extend above the trees by 16 metres not the 7.5 metres suggested by Arqiva. The danger here is that focusing attention on the relationship between the trees and the mast tends to suggest that if that relationship can be improved the mast becomes acceptable, and this of course is not true. On this site any structure of any kind that extends above the tree line will be conspicuous in the landscape for a great distance. Perhaps the actual height of the trees can be established by NNDC? A further comment that was made by the inspector at the appeal for the previous application was that these trees are tall, thin and ivy covered, such that their health and stability may not be good, and little weight can be placed on their long term screening value. The site lies within the north Norfolk Coast AONB and Glaven Valley Conservation Area where North Norfolk Local Development Framework Core Strategy Policies EN1, EN2 and EN8 are relevant. Policy EN1 states that proposals that have an adverse effect will not be permitted unless it can be demonstrated that they cannot be located on alternative sites that would cause less harm and the benefits of the development clearly outweigh any adverse impacts. 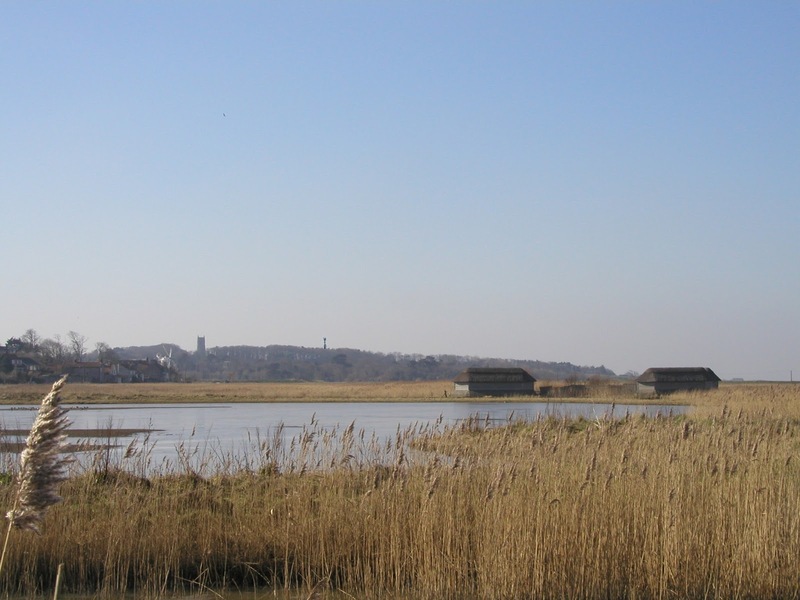 Policy EN2 requires that proposal are informed by the North Norfolk Landscape Character Assessment and that their location, scale and design protect, conserve and where possible enhance the special qualities and local distinctiveness of the area, including visually sensitive skylines, and seascapes. Policy EN8 requires that development proposals preserve or enhance the character and appearance of designated assets, in this case the Glaven Valley Conservation Area and their setting through high quality sensitive design. Policies in the current AONB Management Plan. Policy C9 Supports the provision of necessary facilities and new development to meet proven needs of local communities and businesses, in ways that maintain the area’s natural beauty, including the provision of fast broadband throughout the area”. Policy PB3 Ensures that new development, including changes to existing buildings and infrastructure, within their ownership or powers of regulation are consistent with the special qualities of the area and relevant conservation objectives”. 5. National Planning Policy Framework Also states thatIn National Parks, the Broads and AONBs, which have the highest status of protection, great weight should be given to conserving landscape and scenic beauty. The aim should be to keep the numbers of radio and telecoms masts and the sites to a minimum consistent with the efficient operation of the network. Existing masts, buildings and other structures should be used, unless the need for a new site has been justified. Where new sites are required, equipment should be sympathetically designed and camouflaged where appropriate. National Planning Policy Framework – paragraph 45 requires that:- Applications for telecommunications development (including for prior approval under Part 24 of the General Permitted Development Order) should be supported by the necessary evidence to justify the proposed development. For a new mast or base station, evidence that the applicant has explored the possibility of erecting antennas on an existing building, mast or other structure and a statement that self-certifies that, when operational, International Commission guidelines will be met. [if !supportLists]· [endif]Decisions should be made in line with the Development Plan unless there are valid and overriding reasons for not doing so, based on the merits of the case. [if !supportLists]· [endif]In the absence of up to date Development Plan policies, a decision should be made by consideration of the policies of the NPPF, taken as a whole. [if !supportLists]· [endif]Decisions cannot be made solely on the basis of representations for or against a proposal; they must be based on valid planning grounds, weighing all the evidence and on the merits of the case. 6. Blakeney as a ‘Not Spot’. In order to qualify for inclusion as part of the Mobile Infrastructure Project, Blakeney needs to be a ‘Not Spot’. 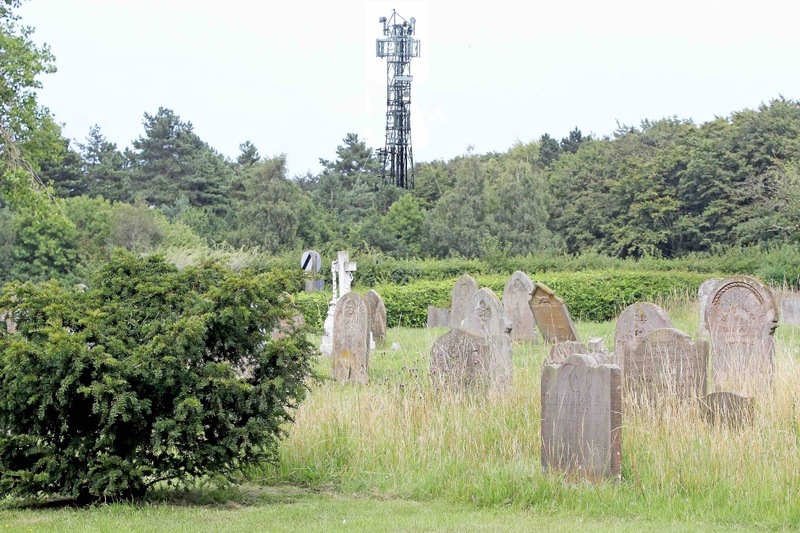 In Arqiva’s words "A new base station is needed as part of the MIP to help provide mobile coverage over a 'Not Spot' that affects Blakeney and the wider area".This is not true as a good signal is available from several providers in and around Blakeney and the surrounding area. To sum up, I am of the opinion that in their haste to get this mast erected within the tight time scales set by the Mobile Infrastructure Project (and it is not our fault that they are running out of time) the applicant has failed to adequately demonstrate, or fully explore the options of the mast being erected in a less sensitive location or the utilisation of an existing building or structure such as within the tower of St Nicholas Church in Blakeney. As a result the proposal fails to accord with the requirements of the North Norfolk Local Development Framework Core Strategy and NPPF. It is my belief believe that short-term pragmatism in respect of mobile phone signals is not a sufficient excuse for destroying important views within an AONB. The necessary improvements to phone coverage can be achieved without doing that. To that end I would like to request that the NNDC insist that a thorough and impartial examination of Blakeney Church Tower be undertaken before it comes to committee . If that process runs on beyond the present phase of the MIP then so be it; the beauty of this coast and its economy are more important than any difference in cost that may result. There are always good reasons put forward for doing these things, and most of us would like a better phone signal. BUT it is the beauty of the north Norfolk Landscape that underwrites our economy. At present there are numerous applications in train that represent significant threats to it. The above is just one of them, the value of the landscape should be fought for by all of us. At just a few feet less than the height of Blakeney Church tower (100 ft) this mast will be visible from Morston, Cley and all of Blakeney Harbour, protruding into one of the most famous and best loved views along this coast. There are statutory designations like AONB status, and Conservation Area status that offer protection from such intrusions, and particular protection through the National Planning Policy Framework for the settings of our priceless listed buildings, and we should do all we can to support them. Blakeney Church, the building in question this time, offers a perfect space within its tower ( at the same height as this mast) for this equipment. Last time an initiative to put it there was thwarted because the phone companies wouldn’t work together. They should be made to. Or at least Harlequin should this time. With heartfelt thanks to you all, we've done it, the Spirit of north Norfolk has won. Yesterday 4th September the members of NNDC’s Development Committee rejected the officer's recommendation for approval and voted 11 to 2 against this application. We thank them for standing up for the people of north Norfolk. But it isn't done yet, despite clear guidelines in the Local Development Framework, there is a notable change of direction by NNDC’s planning officers towards new large, modern buildings in the countryside. The Glaven Valley Protection Group will meet on September 19th @ 7.00 pm in Wiveton Parish Room to discuss the future role of the group in addressing these concerns. If you would like to be involoved then do please come along. The 170 letters of objection NNDC received against this proposal are an indication of how the people who live here feel about this new direction; but will that alter how the planners act? No of course it won’t, because they do not see themselves as answerable to us, they are the professionals and it is we who should accept their advice not the other way round. Several years ago Wiveton spent a good deal of time and money preparing a Village Design Statement which, after a fight was reluctantly accepted by NNDC as supplementary planning guidance. It has sat at the back of the shelf - if not in the waste bin- ever since. This culture has to change; those who live in a place should have a role in the shaping of it. Until recent times they were entirely responsible for its shape and that is how we came to have the distinctive and much loved architecture of north Norfolk. Below is an extract from Wiveton Parish Council's three minute contribution at that meeting, as you will see it highlighted the change of direction on the part of NNDC's planning officers. Interestingly one of the councillors also mentioned this. You have had objections in great numbers, and if you add the almost two and a half thousand people who have visited our web sites to those you’ll get some idea of the level of concern that exists. And from the web site's feedback I can tell you that a storm is brewing along this coast. Despite the Local Development Framework, NNDC planning officers appear to have taken a new direction, one that encourages large new contemporary structures in the countryside, based on an assumption that if their design is radical enough they will somehow enhance it. Well the people who live here don’t share this view, their first question is always the same; what does this new idea say about the existing vernacular style of all our villages, a style that took centuries to acquire its magic. A magic that attracts visitors in their thousands and encourages people to pay a thousand pounds a week to stay in a small cottage in Blakeney High Street. Why do they pay that? They pay because its got the magic.